All palm trees belong to the family Palmae. Within that family, there are over 200 genera and nearly 3,000 species of palm tree. Although largely similar, each genera and species have slightly different growth habits. One of the most visible differences is trunk and leaf growth. Some species retain their leaves and produce hairy trunk growth, resulting in a shaggy, unkempt trunk. Other species are much cleaner: They shed their leaves over time and produce smooth ringed trunks. 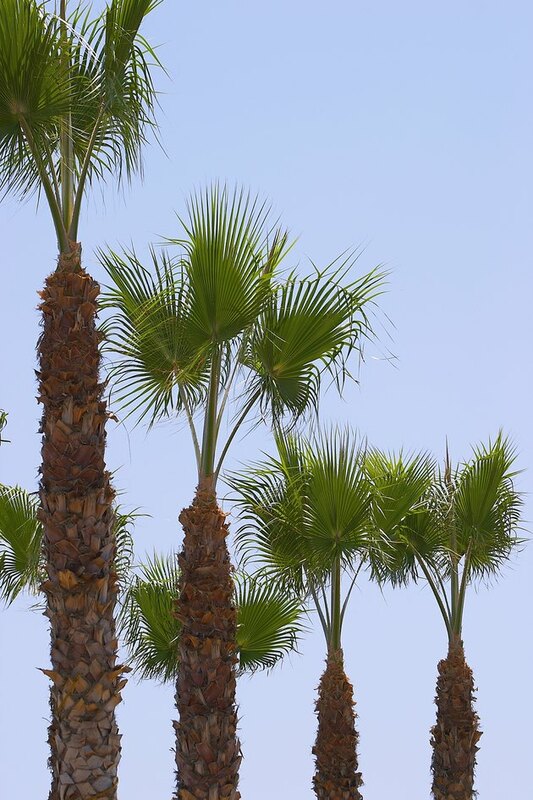 Although you can't do too much to change your palm tree's nature, there are a few steps that you can take to smooth and clean your palm's trunk. The trunks of some palms are naturally shaggy. Leave these jobs to the professionals. Prune the palm tree's petticoat: the dead and dying yellow or brown leaves that hang down below the main canopy. Use lopping shears to saw the leaves off of the trunk of the palm. Leave the base or boot of the palm frond attached to the tree. Use a linoleum knife to cut all of the boots down to the same level with a linoleum knife. In dry climates, these boots often fall away on their own. In more humid climates, they may become a permanent part of the palm. The length of time (from one season to several years) it takes for the fronds to fall depends on the species. For an even smoother look, move on to the next step. Try to pull the boots away with your hand. If they do not come easily (depending on the species of palm), consider leaving them on the tree. Pruning close to a palm tree's trunk is dangerous. Palm tree trunks will not heal if you gouge or nick them. The spot will be susceptible to disease and infestation for the remainder of the palm's life. If you feel comfortable risking the health of your palm, cut the boots flush with the trunk with your linoleum knife. Work carefully. When in doubt, call a professional. Pull the hairs from the trunk of the palm tree (if present). Put on a pair of gardening gloves to increase your grip. Buff the remainder of the hairs away with a sidewheel grinder/sander and a fiber buffing wheel for a smoother look. Buff with only the pressure you need to remove the fibers.